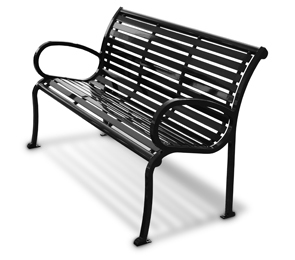 These courtyard park benches are fabricated with care from the finest steel materials available, with a premiere finish that will perform year after year. Offering gleaming good looks and a rugged durability that stands up against pitting, staining and rusting even in the harshest environments. Models are available with a single center arms and with double center arms. Legs have footings with pre-drilled holes for easy surface mounting.